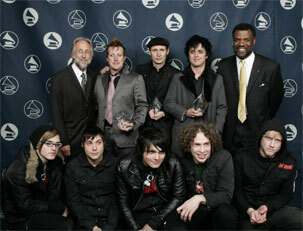 March 19th, 2006, and yet another award for Messrs Armstrong, Dirnt and Cool. Set against a historic backdrop of Union Square, San Francisco, the gala was hosted at Westin St. Francis Hotel in a private ceremony. The Recording Academy, formed in 1957, is better known as the organization that presents the Grammy awards. There are many 'chapters' of the recording academy; the Florida chapter, Chicago chapter and the Philadelphia chapter to name a few. The Recording Academy Honors were first set up to celebrate and honor outstanding individuals, such as our very own Green Day, whose work is excellence to the highest degree and has had a long lasting impact on the recording community. The Recording Academy Honors can be called an award for the elitist of elite. The ceremony is shrouded in mystery, as behind closed doors, family and friends only came to honor award recipients. The evening began with a refined cocktail reception, and was followed by a three course meal accompanied by live music. Also included was a silent auction, with more than 100 collectors items up for sale. The exclusive items included the usual luxurious vacation packages, spa tokens, guitars autographed by female singers Melissa Etheridge and Shawn Colvin. Also, instruments signed by Boz Skaggs and My Chemical Romance appeared alongside many more items. On to the awards. George Duke, Dave Brubeck and San Francisco Blues Festival Founder Tom Mazzolini were all gifted awards, but the night climaxed with the presentation of Green Day's award. Long time producer and friend of the band, Rob Cavallo, presented the award to the band. Although the speech made by Billie Joe Armstrong, Mike Dirnt, and Tré Cool is not known, due to the no cameras or recording equipment rule of the ceremony, it is known that the band thanked former label Lookout! Records and current label Reprise. New Jersey based rockers My Chemical Romance, Green Day's tour protégées, performed a unique medley of some of Green Day's most famous songs. And the icing on the cake? Rob Cavallo took to the stage to tinkle the ivories on the piano. This was also later documented by My Chemical Romance bassist Mikey Way; "We were requested by the fine gentlemen of Green Day to perform their musical tribute", he said, "Dream come true. The smiles on their faces as we played an 11 minute odyssey spanning their whole career? Priceless". All in all, it was one of many nights to remember during the past years following the release of American Idiot, and hopefully for Green Day, there will be many more to come.